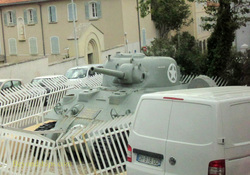 The Jeane d'Arc tank fought in the liberation. 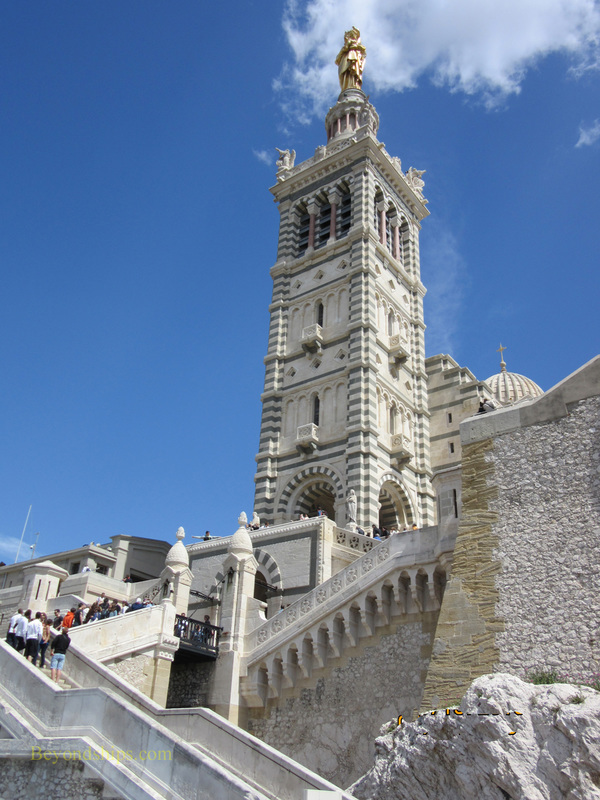 Notre Dame de la Gard is the most visited attraction in Marseille. Indeed, some two million people a year visit. In addition to being a religious site, people come to this place for its history, architecture and the views. The Gard (the Guard) is a limestone rock that towers some 490 feet above the Old Port. 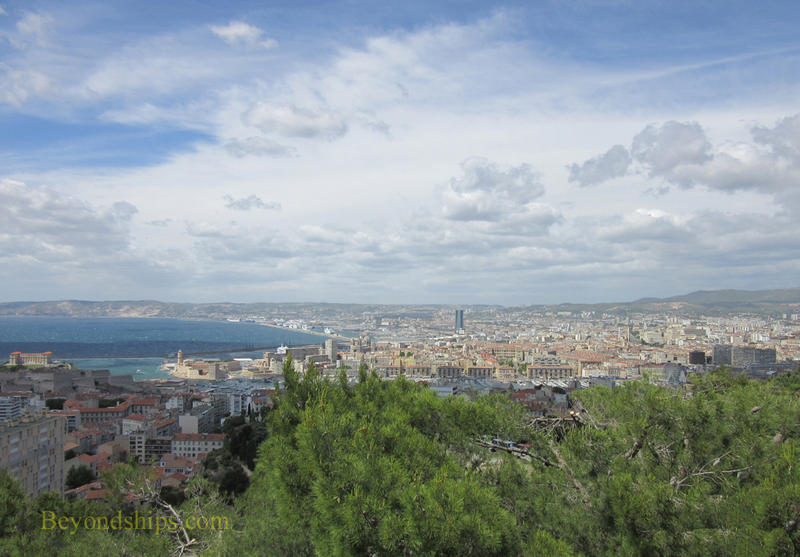 From its peak, you can see not only the city of Marseille but also a considerable way up the coast and out to sea. As a result, this hill has been a lookout and place for beacons since ancient times. 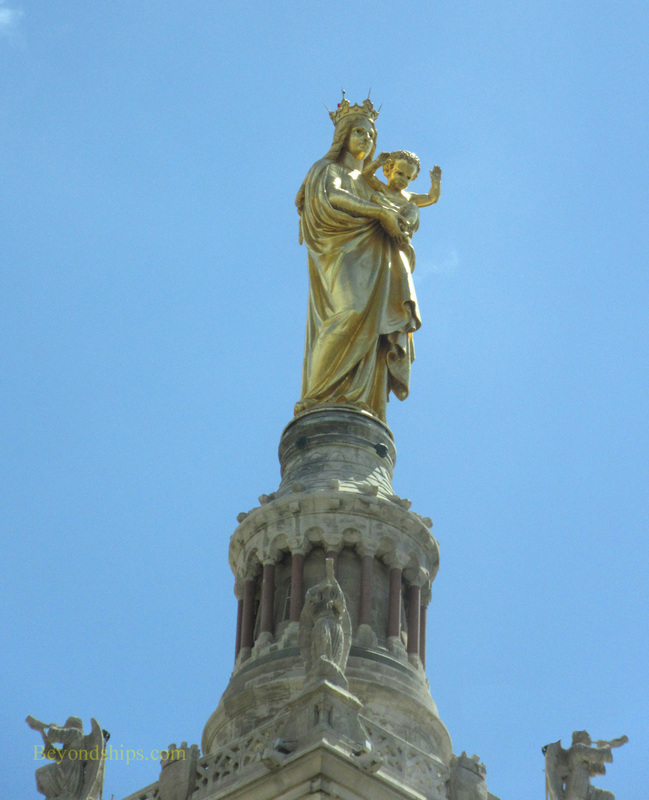 Perhaps because the hill seems to watch over and protect the city, in 1214, Father Pierre, a local priest, obtained permission to build a shrine to the Virgin Mary at the top of the Gard. Over time, the small chapel with its wooden statue of the Virgin became a place of pilgrimage and religious processions. Not long after France and Provence were united, King Francis I came to Marseille and concluded that the city was poorly defended. Because of its height and steep slopes, the Gard is a natural defensive position. Therefore, the king ordered that a fortress be constructed atop the Gard. Work was begun on the fortress in 1524. In an unusual move, public access to the shrine was allowed to continue. The French Revolution outlawed religion and as a result, the shrine was closed in 1792. The silver statue of the Virgin, which had replaced the original statue, was melted down. Other religious objects and the votive offerings by the local populace over the centuries were burned or stolen. This did not spell the end for the shrine. Worship resumed in 1807 under Napoleon. The rebirth of the church started off modestly with a wooden statue of the Virgin donated by a former sea captain and a small bell given by the commander of the military garrison. However, reflecting the affection which the local populace held for the shrine, a new silver statue was commissioned in 1837, an eight ton bell was donated in 1845 and a new collection of votive art accumulated. By the middle of the 19th century, the old church had become too small to accommodate all of its visitors and pilgrims. Surprisingly, the military authorities who controlled the site agreed to the construction of a new basilica atop the fortress. The committee in charge of building the new basilica selected a design by Henri-Jacques Esperandieu, a young Protestant architect. It envisioned a church and bell tower that combined elements of Romanesque and Byzantine architecture and is the basis for the current buildings. Construction began in 1853. During the 1930s, it was decided that the fortress no longer had any military value and an order demilitarizing the Gard was issued in 1934. French troops, however, did not leave the Gard until 1941. Ironically, German troops occupied the French positions the next year. As a result, in 1944, during the liberation of France, there was fierce fighting on the Gard as Free French and Algerian troops expelled the German defenders. Above: Lequesne' statue of the Virgin atop the bell tower. Right: A view of the Old Port. Approaching Notre Dame de la Gard, it is not immediately apparent that it is a church sitting atop a fortress. Rather, architectural elements such as the large staircase leading up to the entrance make it appear like a unified whole with the high walled fortress appearing to be a pedestal. It is only when you come to the draw bridge on the way to the entrance that the military aspect becomes apparent. The new buildings are limestone with green limestone alternating with off-white stone. Air pollution has adversely affected the green stone requiring some seven years of restoration work ending in 2008. Standing in front of the domed church is a square bell tower 130 feet high. It is capped with a round tower which serves as the base for a monumental statue of the Virgin Mary. The statue is made of copper covered by gold gilt and is 36 feet tall. Its artist was Eugene-Louis Lequesne and it was erected in 1870. Inside the church is sumptuous. Golden cupolas crown the ceiling that towers above you. White Carrara marble alternating with French red marble arches support colorful mosaics made of Venetian tiles. On the walls are scores of paintings, not of saints but of ships. Also hanging from the ceiling like mobiles are models of sailing ships. Notre Dame de la Gard has long been a sailors church and these are votive offerings made in thanks for the protection of the ships and their crews and for prayers answered. The church's collection of votive offerings contains more than 2,500 objects. At the far end of the church is a high altar by Henri Revoil. On top of it is a silver statue of the Virgin Mary by Chanuel. Presented in 1837, it replaced the first silver statue, which was melted down during the French Revolution. The vaulted crypt is in stark contrast to the upper church. Somber, it has relatively low ceilings and essentially no decoration. However, it does have the Virgin of the Bouquets, the painted wooden statue donated by the former sea captain after the French Revolution. It gets its name from the bunches of flowers that are placed in the statue's hand. 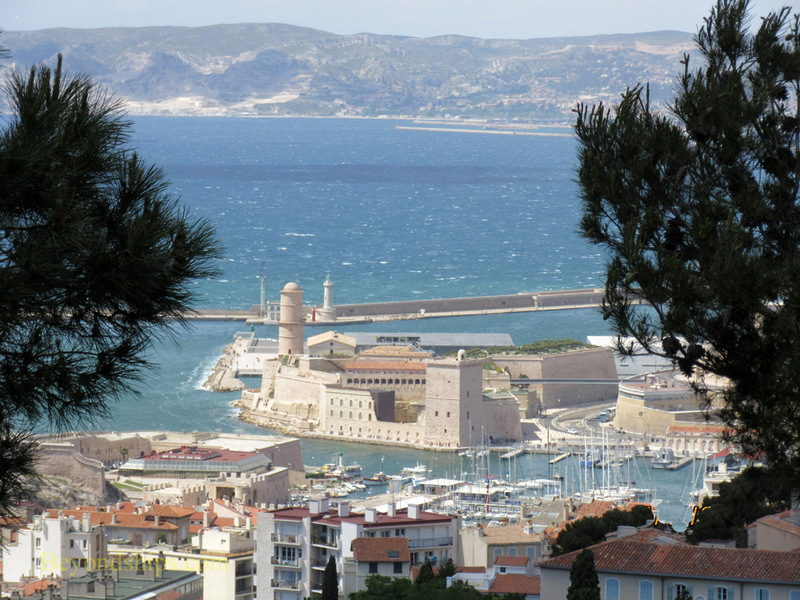 The views from Notre Dame de la Gard are spectacular. Immediately below you is the Old Port. Spreading out from there is the city of Marseille in panorama. From other parts of the ramparts, you can see the infamous Chateau d'if fortress/prison. You can also see quite a way up the coast in the other direction. Indeed, you can see the ships docked at the cruise ship terminal. It is not difficult to understand what inspired generations to build here. Marseille has a high proportion of sunny days. But it can be windy on the Gard especially when the Mistral is blowing. ​Looking down the steep slopes of the Gard, you can see that the basilica is a demanding walk from the Old Port. Accordingly, many visitors prefer to take the local bus (number 60) or take a tour bus.